Google TV has been in the works for a while but the site just opened to the public today – visible at google.com/tv – and the next step in Google’s march to bring the internet to the screen in the sittting room. Described by Google as “an adventure where TV meets web, apps, search and the world’s creativity” it’s a big new departure for the web giant that consolidates its media empire. Google TV is a system that will work with any TV, but you will need to buy a Google TV box which will pump the internet into your current device. Alternatively you can buy a smart TV – a whole new web-enabled monitor. Once it is set up the Google TV system will provide a kind of control panel for your TV. Google search will work across the web and the TV – letting you search for content across the web and the TV. You will also be able to download apps and just browse the internet as you would on a normal TV. You don’t need yet another remote control for it either – your Android phone or iPhone can be used to control your Google TV in place of a remote control. Use your voice to search, and even use multiple phones to control the same TV. You can wirelessly share content from your phone to the TV and Google have optimised Youtube for TV viewing. The world’s most successful tech company does TV? This is going to be good. They say they have “geeking out to make TV as awesome as possible” and for the price (still tbc) of an internet box I’m willing to test it out. It’s also a bit of a step into the unknown, will people really want to use internet on the TV? What will they do on there? How will be it be different to web on computers? What apps will people make? What apps will people use? This is the future, it’s going to be really exciting. 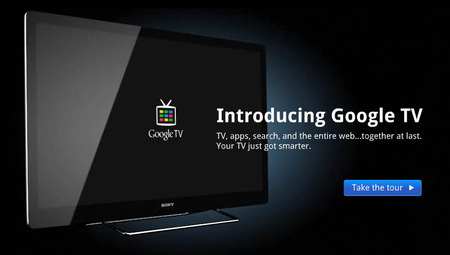 Google has partnerned with Logitech to provide the internet box, and with Sony to provide the new TV. Neither product is currently available but you can register to be notified when they are.